Powercool Smart UPS 2000VA 2 x UK Plug, 4 x IEC, RJ45 x 2, USB LCD Display. We are here to help 01274 471 201. 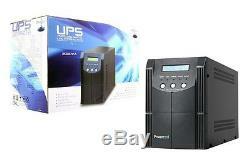 < Back to UPS Battery Backup. Your satisfaction is our No. High Speed Synchronous Phase Transfer. Protection against Overload / Short Circuit etc. 50Hz / 60Hz 1% (Auto Detection). >= 96% (AC Mode), >= 80% (Inv Mode). 110% bypass 60 sec; 120% bypass 30 sec. 110% Shutdown 60sec; 120% Shutdown 5 sec. Communication USB RS232 / SNMP (Option). 90% capacity after 8 hours. 15-20 Minutes (dependant on load). 360 x 145 x 215mm (L x W x H). 492 x 236 x 316mm (L x W x H). We are a long established (15 years) specialist computer company, with a multi million pound turnover and over 55 highly trained staff with hundreds of years experience between them. We are based just outside Bradford near the M62. We are run by enthusiasts, not shareholders. We are not a "stock shadowing" retailer operating from a back room, like many supposed IT specialists , we will be here when you need us. Visit our brand new specialised showroom near Leeds. We design and build our own multi award winning systems, as well as supplying over 10,000 other lines. We have very strong relationships and a high level of support from the major players in the IT world, we are proud to be one of the few IT companies in the highest partnership echelon for Intel, Microsoft, and many others. CCL won the prestigious "PC Pro" Online retailer of the year award three years running - a testament to our dedication to you, the customer. We have a very busy website attracting 300,000 unique visitors every month and process. Every year we process 200,000 orders delivering to all parts of the UK and Europe. Choose Other 24 Hour Courier. We will then send your item via DPD - a service with numerous advantages. No need to stay in all day! Follow My Parcel service lets you see where the driver is and get a final 15 minute time-slot. Choose Other 48 Hour Courier. We deliver to all EU countries and also to Australia. Most larger items are delivered by DPD. This is a fully tracked service. You will be able to track the parcel online at all stages of its journey. Other EU countries take slightly longer. Deliveries to Denmark, Italy, Portugal, Spain and Sweden use a different courier. Add all the items you want to your basket. Proceed to the checkout from the basket and pay. If you change your mind and want to return an item, we can provide the above service for a small charge. Why Choose CCL For Your Order? The item "Powercool Smart UPS 2000VA 2 x UK Plug, 4 x IEC, RJ45 x 2, USB LCD Display" is in sale since Tuesday, May 05, 2015. This item is in the category "Computers/Tablets & Networking\Power Protection, Distribution\Uninterruptible Power Supplies". The seller is "cclcomputers" and is located in Bradford.